Need something with a little more presence than a standard round or sheet cake? Our custom-made tiered cakes stand out for any occasion. 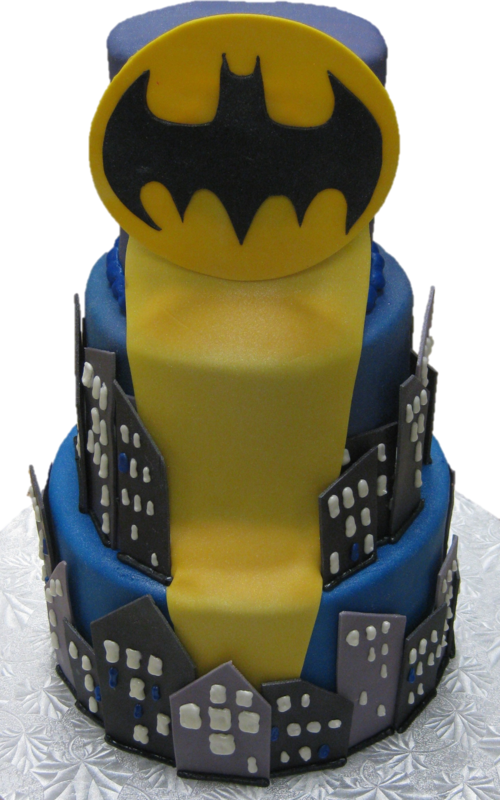 At Wildewood Pastry Shop, we're skilled in crafting specialized tiered cakes to fit any theme. 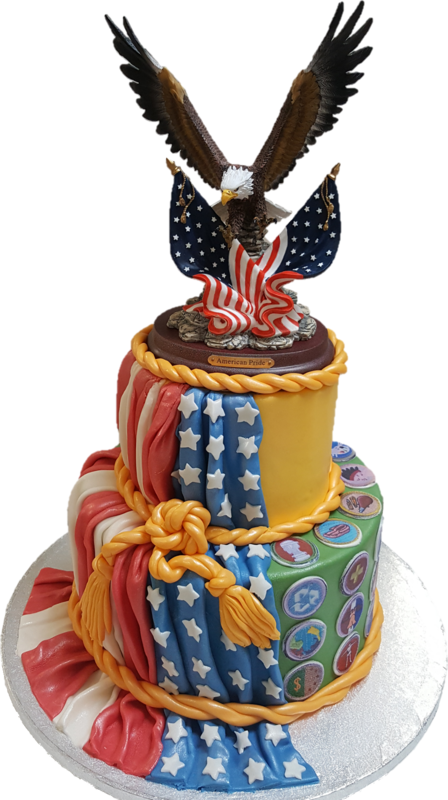 Birthday parties, military honors/commemorations, Boy Scout promotions, holiday gatherings, baby showers, retirement or going away send-offs, celebrations of any kind. You name it -- whatever your occasion, our tiered cakes can be the main event. All custom cakes are hand-made by our pastry chef, who brings over 35 years of professional experience to each and every order. With four layers of cake and three layers of filling in each tier, these cakes are best suited to large gatherings. Tiered sizes typically start at 30 servings. If you need something smaller, we also offer single tier options that are taller than our standard round cakes. 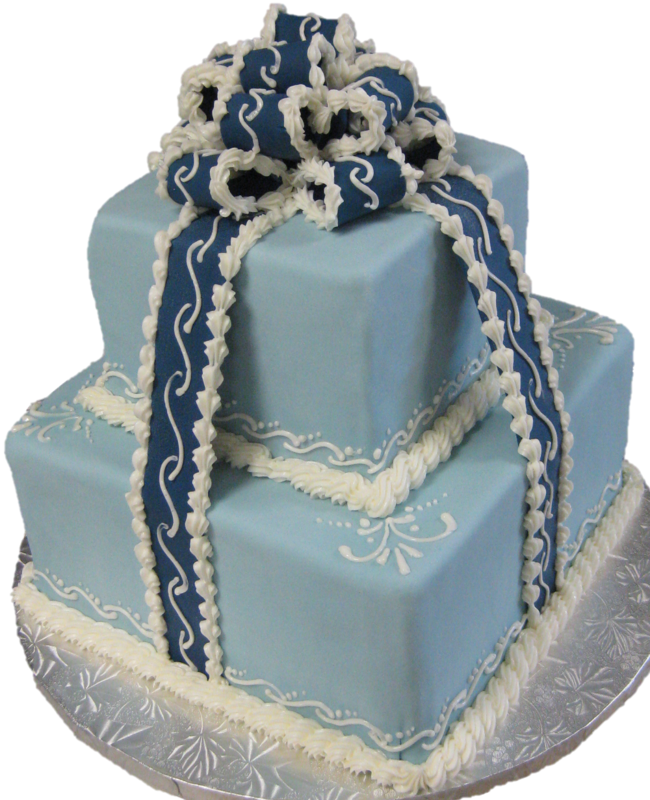 Both single-tier and multiple-tier cakes come on a sturdy silver board. For weddings and anniversaries, please see our wedding page! Tiered cakes are typically decorated with fondant, allowing us to bring a diverse range of ideas to life while remaining fully edible. If you have toys or a topper that you would like us to use while decorating your cake, please provide these items sealed in their original packaging. Due to sanitary concerns, we cannot accept used or opened items, so please keep this in mind when ordering. If you're interested in seeing some examples of our tiered cakes, take a look at our Flickr page for a variety of both single-tier and multiple-tier cakes that we've made in the past. Advance notice for a tiered cake is ideally one week ahead of your desired pick up date. For a price quote on a particular design, feel free to drop by the shop with a picture, or send us an image of the design over email. Be sure to include important details such as serving size, flavor choices, and desired pick up date. Keep in mind that designs take time to review, and your design may take a few days to accurately quote. Base cake prices before decoration cost are readily available in store or via phone. Due to the size and height of a tiered cake, no box will be provided on pick up. Additionally, store clerks cannot carry your tiered cake out of the shop for you, nor can they leave the shop to assist you. Please take these factors into account when picking up, and always bring someone to assist you in carrying your order out of the shop.